Reliable and long term proven serial communication is increasingly being replaced by faster, up-to-date data exchange in real time via Ethernet-based bus systems because of higher speed, greater flexibility and possibilities of topology extension. 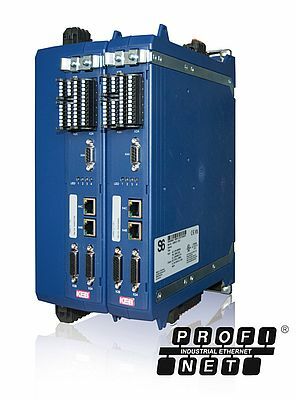 With its compact, flexible servo-system Combivert S6, KEB follows this trend and is already able to offer the ProfiNet interface integrated in device variant A as the ideal supplement to the existing standard EtherCat connection. Speed and flexible user-convenience are key aspects in particular: an innovative feature is the possibility of switching between both interfaces for software parameters - there is therefore no need in principle for the costly separate purchase of a ProfiNet module, expensive additional storage and extra commissioning costs. The inplementation of PowerLink and Ethernet IP is also planned in future on this basis. KEB can rely on a broad customer interface as a source of ideas from the market in order to incorporate innovative trends in current product development. A further innovation in the Combivert S6 is attributable to this: in addition to the extended communications concept for the control level, device variant A contains a package of modular selectable functional safety technology features. With immediate effect, module 1 is obtainable with safe stop (STO) and safe brake control (SBC) as standard integrated functions. With module 3 which will be available in the near future, the concept will be extended with further fourteen safety functions, which can all be easily managed by FSoE (Fail Safe over EtherCAT) without any expensive wiring.